Electronics manufacturers in Singapore are looking to another strong year in 2018, after a slew of new product launches – including the iPhone X – helped lift growth in the sector this year. Manufacturing, which makes up a fifth of the Singapore economy, has turned in an outstanding report card, prompting some economists to upgrade their forecasts for Singapore’s economic growth this year. DBS senior economist Irvin Seah said in a report out on Wednesday that he now expects the economy to expand 3.2 per cent this year, from a previous estimate of 2.8 per cent – due in large part to manufacturing’s standout performance and a steadily improving global outlook. Official forecasts tip growth of 2 per cent to 3 per cent for this year, with the final figure expected to be at the upper end of this range. He has also upgraded his forecast for full-year economic growth next year, from 2.5 per cent to 3 per cent. But some analysts have warned that the breakneck pace of growth in factory output could begin to cool, even as segments related to oil and gas continue to struggle. 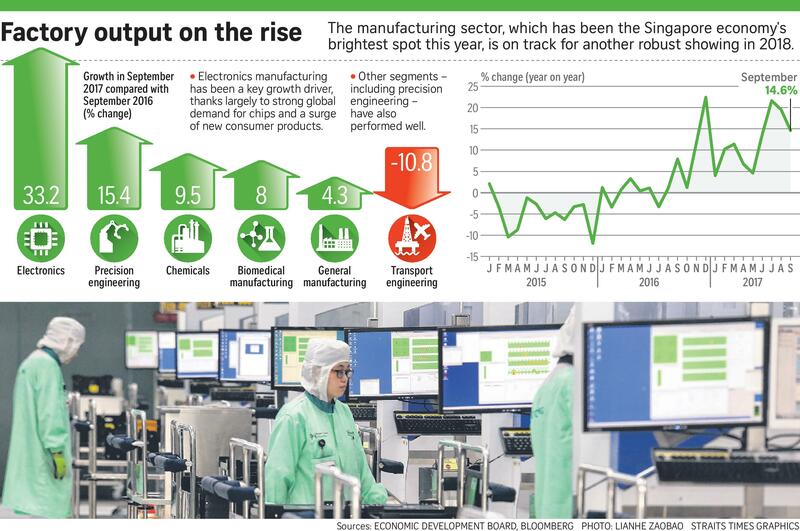 Strong global demand for electronics – in particular, semiconductors – has boosted Singapore’s manufacturing sector since late last year. Factory output for the July-to-September quarter surged 18.5 per cent this year over the same period last year, higher than advance estimates of 15.5 per cent previously forecast by the Trade and Industry Ministry. Finalised third-quarter economic growth data is due out next week. Mr Allen Ang, group managing director of Aldon Technologies, said the slew of new electronics products released in recent months helped spur a 15 per cent uptick in the firm’s business in the first half of this year, compared with the corresponding period a year earlier. “Our market is related to the end-customer releasing new products and technologies. The third quarter was when all the new products, such as the iPhone X, came out,” he noted. The firm refurbishes parts for flat panel and semiconductor makers. Activity has slowed slightly in this half of the year, he said, but he expects sales to remain robust going into next year. Still, manufacturers continue to face challenges like rising business costs, as well as disruption from emerging technologies related to Industry 4.0 – the trend of automation and data exchange on factory floors. United Overseas Bank economist Francis Tan said growth remains uneven across manufacturing clusters and has been “overly reliant on the cyclical increase in the demand for semiconductors and its surrounding services”.